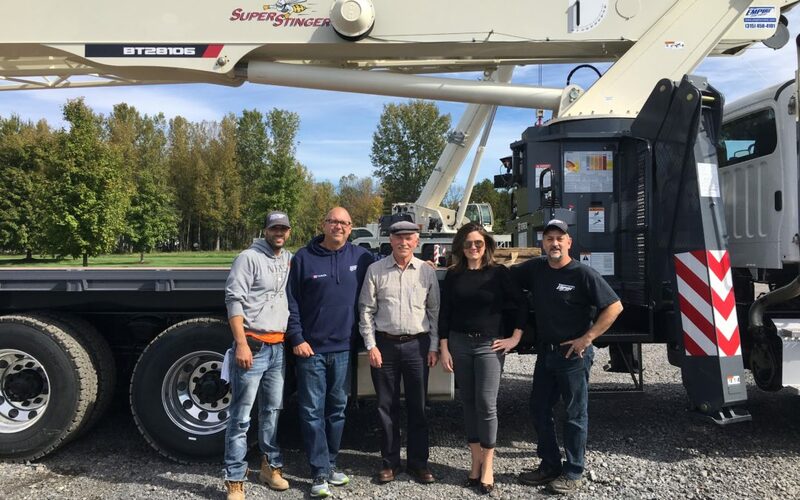 Empire Crane delivers the ninth Terex crane for Elmer W. Davis, Inc.
On Friday October 5th Elmer W. Davis, Inc. picked up their new 2018 Terex BT28106 boom truck from Empire Crane Company, LLC in Syracuse, NY. The BT28106 will be the 9th Terex (4th BT28106) in their continually growing crane fleet. Elmer W. Davis, Inc. is the largest roofing contractor in NY and have become particularly fond of Terex Boom Truck Cranes. Superintendent Damon Runyon expressed the “ease of service” with his Terex machines, “they are reliable cranes with almost no downtime”. The crane’s first job will be a roofing at the Wegmans Supermarket in Fairmount NY.